Heroes of Might and Magic has 7 distinct types of cards. They are Heroes, Units, Towns, Locations, Artifacts, Skills and Spells. Below is a description of each type. 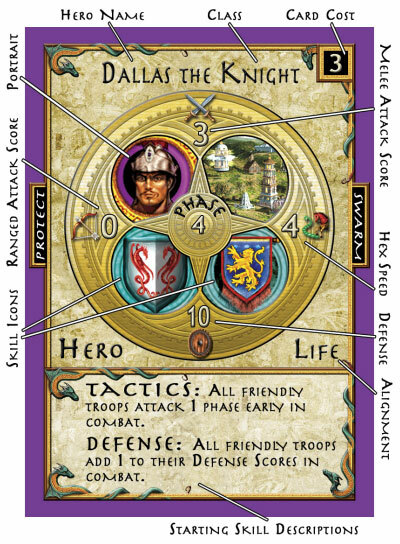 Hero Cards represent a particular character in the game. These characters could be from any of 11 classes. The classes include Knight, Priest, Death Knight, Necromancer, Lord, Mage, Thief, Sorcerer, Archer, Druid, and Barbarian. Below is a diagram you can refer to when the rules mention the entries on a Hero Card.